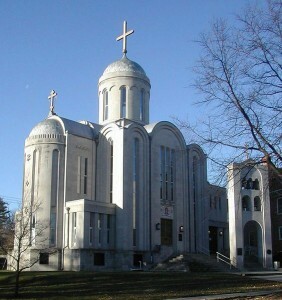 The Enthronement of His Beatitude, Metropolitan Tikhon as Primate of the Orthodox Church in America will be celebrated at Saint Nicholas Cathedral, Washington, DC, on the weekend of January 26-27, 2012. On Saturday, January 26, the Vigil will be celebrated at 5:00 p.m.
On Sunday, January 27, the Divine Liturgy, followed by the Rite of Enthronement, will begin at 9:00 a.m.
A banquet will be held at the Omni Shoreham, 2500 Calvert Street NW (at Connecticut Ave.), Washington, DC. A reception will held at 2:00 p.m., followed by dinner in the Regency Ballroom at 3:00 p.m.
Banquet reservations and menu selection (meat/fish) should be sent to enthronement@oca.org. Tickets are $100.00 per person. Deadline for reservations is January 14. The Holiday Inn Georgetown also is available. To make reservations, log on to http://www.holidayinn.com/hotels/us/en/washington/wasgt/hoteldetail. Metropolitan Tikhon was elected at the 17th All-American Council, held in Parma, OH on November 13, 2012. See related story. In related news, the Holy Synod of Bishops encourages the participation of clergy and faithful in the annual March for Life on Friday, January 25. Participants are asked to gather by noon under the “Orthodox Christians for Life” banner to the right of the state at the Ellipse. In conjunction with the March, Vespers will be celebrated on Thursday evening, January 24, at Saint Nicholas Cathedral. Additional information on the March will be forthcoming on the OCA web site.